Mapping Derby was a project I created for FORMAT International Photography Festival. FORMAT Festival and QUAD have a strong background in Mass Participation and each festival they run many international and local mass participation projects working with artists and creatives from around the world to deliver these. Mapping Derby started with the question: How do you engage a photography hungry audience? The project aimed to engage the photographer (professional and amateur) while still engaging schools, local residents and day visitors. A project that can reach out to everyone, and offer multiple engagement opportunities. Inspired from a mapping project I worked on for Buxton Museum, and with input from FORMAT’s Curator Louise Clements, I created up Mapping Derby. 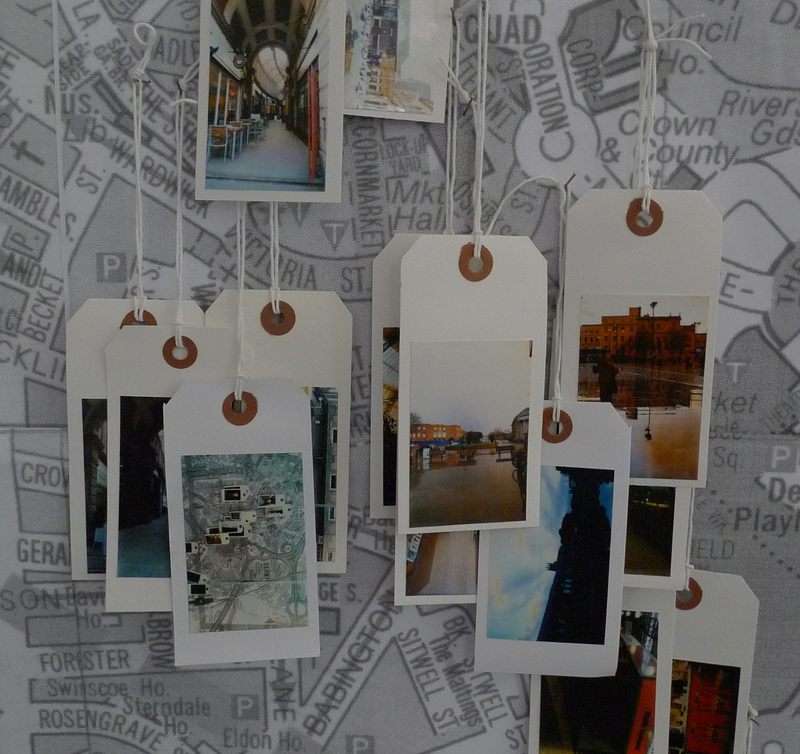 A simple premise, residents and visitors to Derby were given the challenge of photo-mapping the city. Anywhere that captured their eye, inspired them, held memories, meaning, the city was their canvas. In an empty shop-come-gallery a public photography exhibition grew day by day, as participants dropped in with their cameras and mobile phones to share their photographs with FORMAT and the city. What made the project engaging and unique was the room-sized Derby map which filled 3 walls of the exhibition space. Using instant photo printers, participants came into the space, printed their photo, attached it to a luggage tag, added text and location to the reverse and then physically nailed it to the wall. Participants loved the low-tech-meets-high-tech, retrotech affair. The project ran for 2 months, regular participants started dropping in early in the morning to find empty spaces on the map, setting themselves a challenge to fill the gaps in as many creative ways as possible. To engage the widest possible audience we had a bespoke web application created by 83AV where participants could upload and geotag their photos online. The project was extremely successful, with over 1000 photographs submitted online and in person, we ran photography workshops and walks from the popup gallery space. Reaching out to a wide audience of participants. Following on from that, we were invited to run a bespoke version of the project for Rufford Gallery, called Mapping Nottinghamshire. Rufford chose not to go for a web application for the project. This led us down an interesting line of research into free online engagement tools, we discovered that tumblr offer shared tumblogs which are offer great potential and adaptability for online participation. I’ve since gone on to re-run this project at TATE Britain, working with young people to map their #OffTheGrid spaces, the un-mapped spaces in their lives. How do we categorise the spaces in our lives? The places we go to to see friends, to be alone, to create, to think…? Working with TATE Collective we mapped the unmappable tracing the spaces that we know and hold personal meaning. I’m currently working with First Art to develop Mapping for their people and places project, which is very exciting as I just love running this project, watch this space for developments.